Today’s card features the Stampin’ Up! Hold on to Hope Stamp Set! This stamp set holds a special place in my heart. I’m honored to have had the opportunity to design this stamp set for you. You can find it on p. 27 of the 2018 Stampin’ Up! Occasions Catalog. 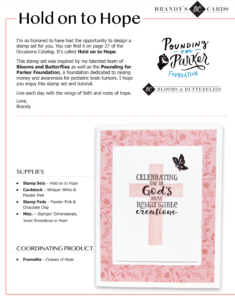 This stamp set was inspired by my talented team of Blooms and Butterflies as well as the Pounding for Parker Foundation, a foundation dedicated to raising money and awareness for pediatric brain tumors. I hope you enjoy the tutorials featured below. And don’t forget to visit my Brandy’s Cards Stamp Club to enjoy the tutorial on how to package your Hold on to Hope cards for a gift. Always… Live each day with the wings of faith and the roots of hope. 2. 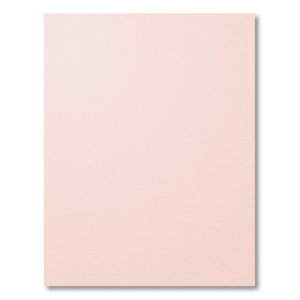 Cut a 3-7/8″ x 5-1/8″ piece of Powder Pink Cardstock. 3. 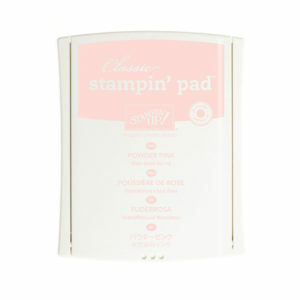 Use a Powder Pink Ink Pad to stamp your background on your Powder Pink Cardstock. I used the flourish stamp. 4. Center and adhere your Powder Pink piece to the top of your card base. 5. 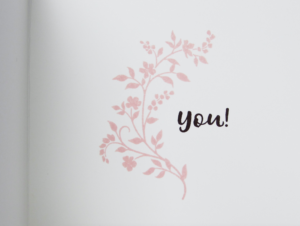 On the inside of your card stamp the flourish stamp using Powder Pink Ink. 6. Next, stamp “You” in Chocolate Chip Ink. 1. 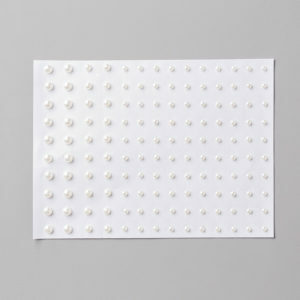 Cut a 2″ x 4″ piece of Whisper White Cardstock. 2. Center and adhere this piece to the top of your Powder Pink Cardstock. 3. 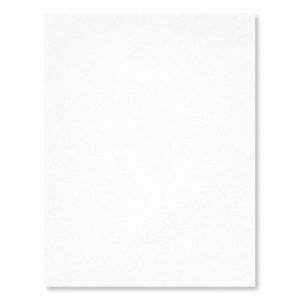 Cut a 1-3/4″ x 3-3/4″ piece of Whisper White Cardstock. 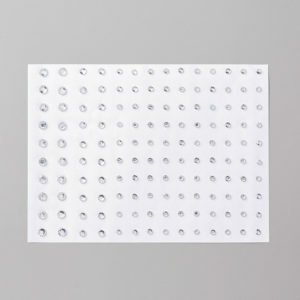 You’ll want to stamp your image on this piece of cardstock. 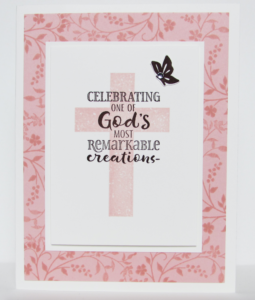 Tip: I used Powder Pink to stamp the cross so that I could use a darker color to stamp my message. Keep that in mind when selecting colors to pair. 4. Stamp the cross, in Powder Pink, in the center of your 1-3/4″ x 3-3/4″ piece of Whisper White Cardstock. 5. 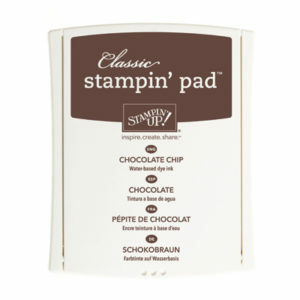 Next, stamp your sentiment using a Chocolate Chip Ink Pad. 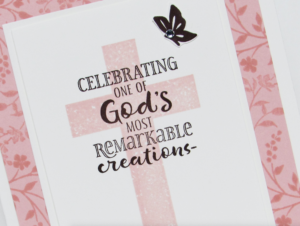 Tip: Be sure to stamp your cross and sentiment before adhere your cardstock. This will give you another try if you make a mistake. 6. Using stampin dimensionals center and adhere your image to the 2″ x 4″ piece of Whisper White Cardstock. 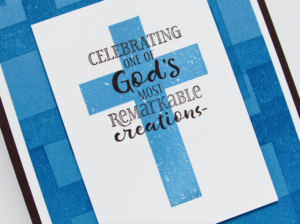 Tip: I used a few stampin dimensionals because I liked the cardstock with the cross raised. 7. Stamp your butterfly, in Chocolate Chip, on a scrap piece of paper. Hand cut out your butterfly! Tip: If you purchase the coordinating Crosses of Hope Framelits you can die cut the butterfly. 8. Adhere your butterfly to your card using a mini glue dot and don’t forget to add a jewel rhinestone or pearl. Today’s card features the Hold on to Hope stamp set. This stamp set holds a special place in my heart and I designed it for you!